Ocean Tigrox is a writer and editor hailing from the Western prairies of Canada with dual citizenship in both Alberta and Saskatchewan. 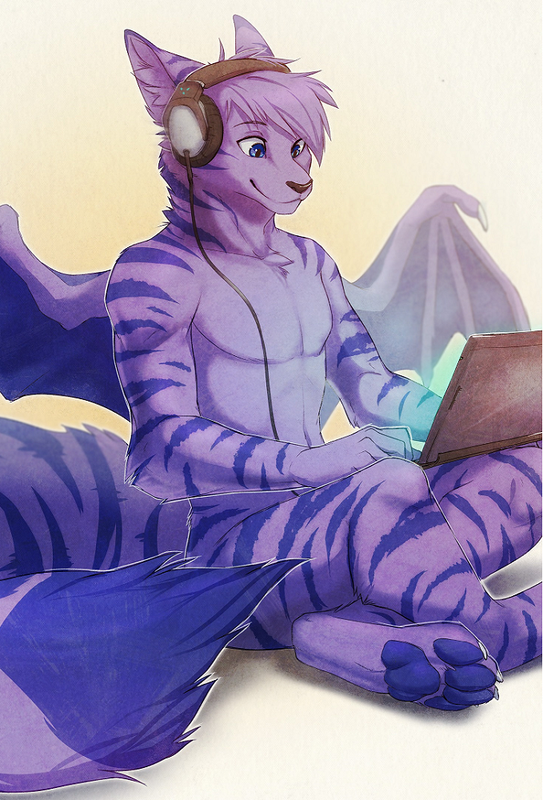 Never far from his headphones, he’s often found shaking his stripes to his love of EDM while writing up another story. His favorite genres to write are action and adventure based: pulp, noir, or a good futuristic sci-fi. Along with storytelling, the purple Tigrox also enjoys motorcycling, travel, games of all varieties, and expressing strong opinions about his hatred for winter to all who will listen. He is the lead cat herder, editor, and co-host of the furry writing podcast Fangs and Fonts (fangsandfonts.com). He is the lead editor of Inhuman Acts, a collection of anthropomorphic noir stories. You can find some of his published works in such anthologies as: Roar 6, The Furry Future, Furtual Horizons and PULP! Sometimes he posts things on SoFurry (ocean.sofurry.com). To hear his random ramblings and writing updates, follow him on Twitter @TigroxTales and @OceanTigrox.